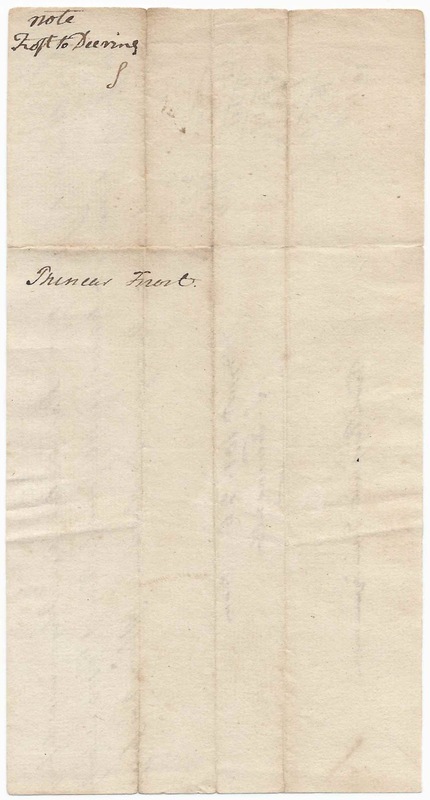 Handwritten document dated 1 June 1797 at Portland, Maine, between James Deering and Phinehas Frost. The document also bears a name that appears to be S. Freeman, possibly the Samuel Freeman who served as a selectman and judge at Portland. 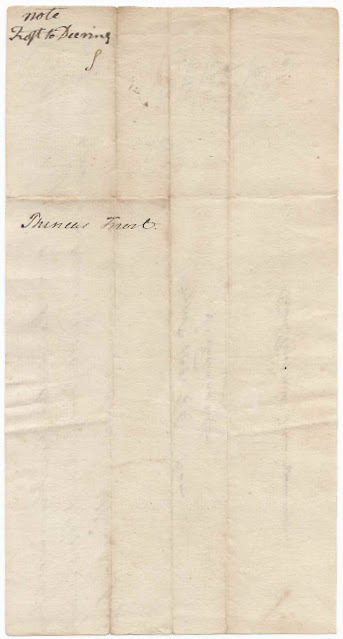 The document is approximately 7-3/4" x 4". 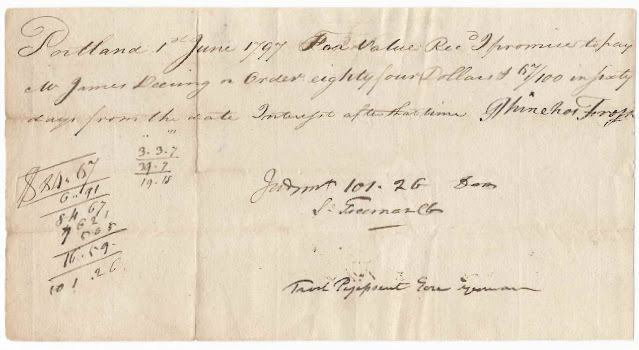 Portland 1st June 1797 For value Recd. I promise to pay Mr. James Deering on Order eighty four Dollars & 67/100 in sixty days from the date. Interest after that time. Phinehas Frost. James Deering may have been the James Deering born 23 August 1766 at Portland, Maine, son of millionaire Nathaniel Deering and husband of Almira (Ilsley) Deering, daughter of Enoch Ilsley. That James died at Deering, Maine, in 1850. His sister Mary "Molly" Deering married Commodore Edward Preble. Phinehas Frost may have been the Phinehas born at Alfred or Berwick, Maine, about 1749, son of William and Love (Butler) Frost and husband of Margaret (Gerrish) Frost. That Phinehas Frost died at Freeport, Maine. As noted above, I'm wondering if S. Freeman might have been Samuel Freeman, who had been a Secretary to the Continental Congress at Watertown; a Justice of the Peace, a Judge of Massachusetts Supreme Judicial Court, and a selectman and probate judge at of Portland, Maine. The online Maine Memory Network displays two pages of items relating to Samuel Freeman. 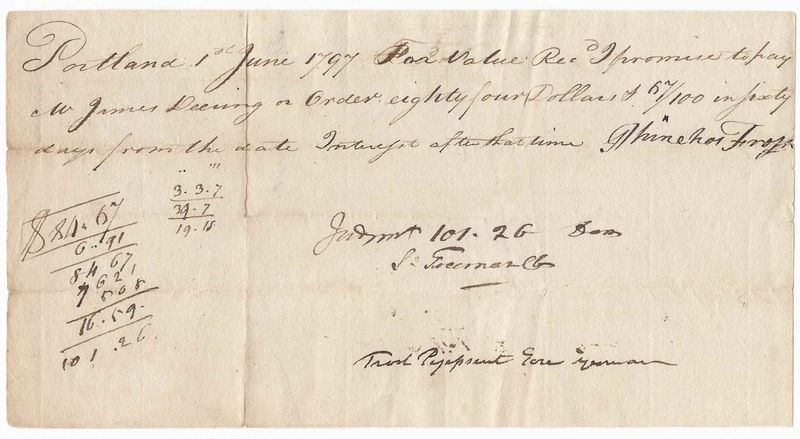 Interestingly, what became the town of Freeman, Maine, in Franklin County, was granted in 1791 to Samuel Freeman, Enoch Ilsey, Thomas Sanford and Nathaniel Deering as compensation for their losses incurred when the British burned Falmouth, Maine [now Portland] in October 1775. If the James Deering mentioned in the document at top is who I think he was, his father and his father-in-law were two of the original grantees of Freeman, Maine. I'd be interested to hear readers' theories about the identity of these two men and their take on the name that appears to be S. Freeman, possibly Samuel Freeman.